Every Saturday May through October! No one knows downtown like our own General Grant. He’s more than happy to take you and your family for a tour of his favorite places on Main Street – like the DeSoto House and the famous Green Street stairs. He’ll share the stories associated with the many buildings on the National Historic Register and share his experiences when his family owned a leather and saddlery shop more than 150 years ago. 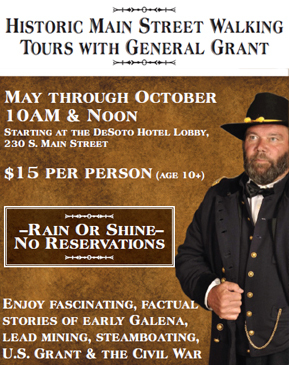 Regularly scheduled walking tours with General Grant are available every Saturday from May through October. Tours operate at 10 a.m. and 12 noon and begin at the DeSoto House Hotel at 230 S. Main Street. No reservations are necessary. Meet at the hotel lobby.